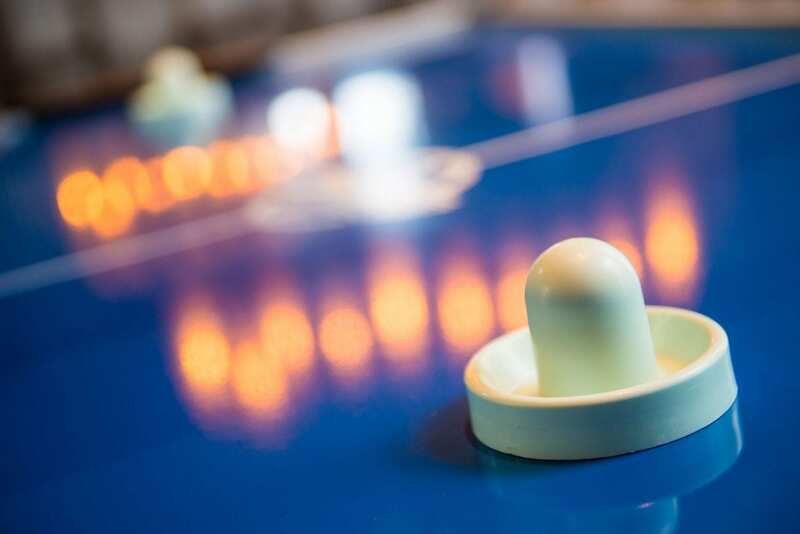 Since the 1970s, air hockey has been a game of friendly competition and excitement inside arcades, bars, and at-home game rooms. Having an air hockey table in the home is the perfect way to bond with family and friends. From a quick game for 2 or a tournament night for your friends with beers, this game is always the center of attention in any game room. Air hockey is favorite subject to Games For Fun. We love being able to provide families and businesses with one of the unique and dynamic games in the industry. Whether you envision a fashionable, modern style like our 7 Foot Monarch Table, or something more relaxed and fit for the kids like our Dynamo Arctic Wind Table, we will help you find the table best suited for your home. Having an air hockey table requires regular, yet simple maintenance to keep it looking and running its best for years. The key to a smooth surface that provides the best gameplay is keeping your table clean. If you are a regular player, we suggest cleaning your table once a week. Regardless of where your table is placed, a simple wipe down with a cloth will ensure that no dust is building up inside the air holes. The best way to avoid clogging the holes during cleaning is to turn on the blowers beforehand. The holes on the table should be cleaned about once a year. The best (and easiest) way to keep your table clean when it’s not in use is by keeping a table cover over it. Especially if you are not going to be playing for a long period of time, a cover is necessary to avoid any dust from collecting on the surface and pipes. Not only can dust clog the air holes, but it can eventually find its way into the motor. A cover is a vital piece in keeping your table running at the best quality. Nothing is more frustrating than playing air hockey on an uneven surface. After many intense rounds of play, your table can begin to show warping effects that are caused by leaning and moving the table around. Every few months, check on the stability of your table and ensure everything is tightly in place. The best way to avoid any unevenness is by keeping rough play at a minimum. The surface of an air hockey table is slick and smooth. In order to keep up with the fast-paced excitement of the game, having a surface that allows the puck to glide seamlessly on the surface is crucial. After you have cleaned the surface from any dust and debris, smooth out your mallets and pucks with sandpaper. A smooth bottom surface quickens the pace of your pucks for a much more exciting game. With these tips and tricks, you can keep your table in its best shape for everyone to enjoy. With so many different styles to choose from, finding the perfect air hockey table for your home can be a difficult task. Our staff is happy to take you around our showroom in San Bernardino and show you all of the models we have available. We want to ensure you get the table of your dreams that can stay in your family for years to come. Right now, we are offering 0% same-as-cash financing on orders $500 and up for 12-months! We would be happy to walk you through the different styles of air hockey tables in our showroom in San Bernardino. Visit us right off of the 215 freeway on exit 43 for West 2nd Street.